Chrome/Firefox: Last week, we showed you how to access Netflix's secret codes pages that direct you to specific movie categories like film noir, satires, or slapstick comedies. Super Browse is an extension that integrates that directly into the Netflix site. 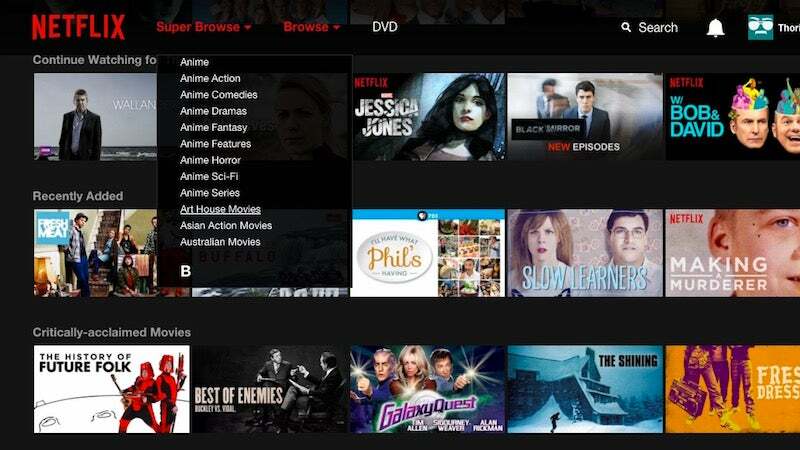 Super Browse adds a drop-down menu revealing all the different secret Netflix categories so you don't have to type in a specific URL code to get to them. When you're in the mood for a very specific type of movie, this makes it a heck of a lot easier to find what something to watch. Been using this guide https://goo.gl/s06g5E to unblock the much better US/UK Netflix regions in Australia. Gives me tons of more choices to watch on Netflix.